Overall, the team puts together a solid comedy (with Night School) that is short on surprises but long on laughs. Giving the go-ahead to a comedy with Kevin Hart (Jumanji: Welcome to the Jungle) and Tiffany Haddish (Girls Trip) set in a high school, being directed by the proven Malcolm D. Lee, had to have been one of the easiest movie studio decisions of the year. Neither actor ever really strays too far from their standard material and you generally know what you are going to get when you cast Hart and Haddish…funny. Thankfully, in Night School, that seems to be the case. Hart stars as Teddy, a slick and stylish BBQ salesman who can talk his way into every sale and out of every problem. Unfortunately for Teddy, he seems to create one problem that he cannot talk his way out of and he finds himself needing to get his GED so he enrolls in Night School. After accidentally blowing up the business that he is set to inherit, Teddy finds himself in need of a job and his friend, Marvin (Ben Schwartz), offers him one in his financial firm. This is where the need for his GED comes in. Haddish is cast as Carrie, the Night School teacher who is basically the flip side of Teddy. She can dish it out just as quickly as Teddy can. The film really soars when Teddy and Carrie go toe to toe in the classroom. Carrie isn't the only obstacle that Teddy finds in night school. He discovers that the guy who used to bully him in high school, Stewart (Taran Killam; 12 Years a Slave), is now his principal. Even though you have two of today's comedy titans with Hart and Haddish working together, what really makes the movie work is its perfect supporting cast. Aside from Killam, surrounding Hart and Haddish are Rob Riggle (21 Jump Street) as Mackenzie, Mary Lynn Rajskub (24) as Theresa and Al Madrigal (The Daily Show) as Luis. Heck, even Fat Joe makes an appearance as Bobby, who skypes in from prison. Each actor is given the space to work their magic – be sure to see Rajskub's Theresa and her "Crack it like a walnut" scene. The 4K video quality is terrific with exacting details and a vibrant color palette. It compliments the DTS:X audio beautifully but the sound quality is really where the 4K disc shines. The dialogue is crisp and clean which is what you want in a comedy but the quality also enhances the soundtrack which is an eclectic mix of musical genres. The extras are stacked and alone are worth a sitting with a bag of popcorn. Audio Commentary - Feature-length audio commentary with Director Malcolm D. Lee. Crossing, Macs Wrestling, The Truth and Flash Cards. Night School's in Session! – Get to know the Night School class members. Who's the Student? Who's The Teacher? – Hart and Haddish discuss their friendship over the years. Prom Night Revisited – A look at the prom scene as the cast discusses their own prom memories. Cap'N Gown 'N Giggles – A behind-the-scenes look at Teddy's graduation speech and the comedy that ensued off the camera. Making of the Dance Battle – A look at the prom dance battle scene. Christian Chicken – A commercial for Christian Chicken. Game Over - Kevin Hart, Yvonne Orji, and Megalyn Echikunwoke discuss the relationship between Teddy and Maya. Extended Performance "El Sueno" – An extended version of Luis's original "El Sueno". My only issue with the film is that its lowest points are when it takes on its serious tones in explaining that Teddy has learning disabilities and that is why he has difficulty in the classroom. It took me out of comedy moments and I found it distracting (I know…ironic). Why does every comedy need to have a message? Whatever happened to funny just being funny? Overall, the team puts together a solid comedy that is short on surprises but long on laughs. 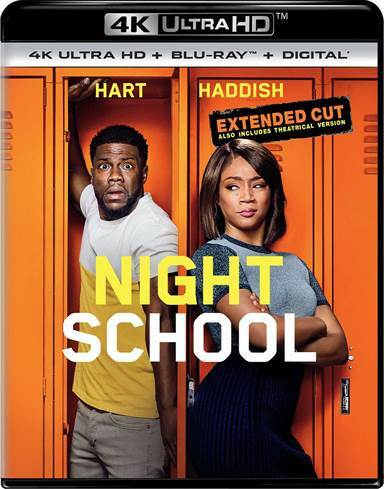 Download Night School from the iTunes Store in Digial HD. For more information about Night School visit the FlickDirect Movie Database. Sean is the publisher and professional photographer. In his 20 years of photography, he has photographed over 2,500 events. When Sean taking photos, you can find him sitting in the 4th row at the local Cineplex. Sean Graduated FIU in 1999 with a political science degree and was the art and entertainment editor for the Beacon newspaper. Read more reviews and content by Sean McCloskey.